Starting off with primer – so necessary in this weather! I’ve been using the NYX Studio Perfect Photo-Loving Primer. I switched over to this in the heatwave after using my The Ordinary Primer for a while, just to see how the two compared. If I’m honest, I’m still getting to know primers and learning what works and what doesn’t for me. This particular primer is silky and provides a matte finish. This is something I don’t entirely agree with – my skin definitely still needs powdering in the day if I want to avoid looking like a shiny mess, but it does help keep my face stay put throughout the day. For my base, I’ve been switching between two products. For the fuller coverage days, when my skin’s being a bit of a pain I’ve been reaching for the Rimmel Wake Me Up Foundation. This foundation is known for its dewy finish. 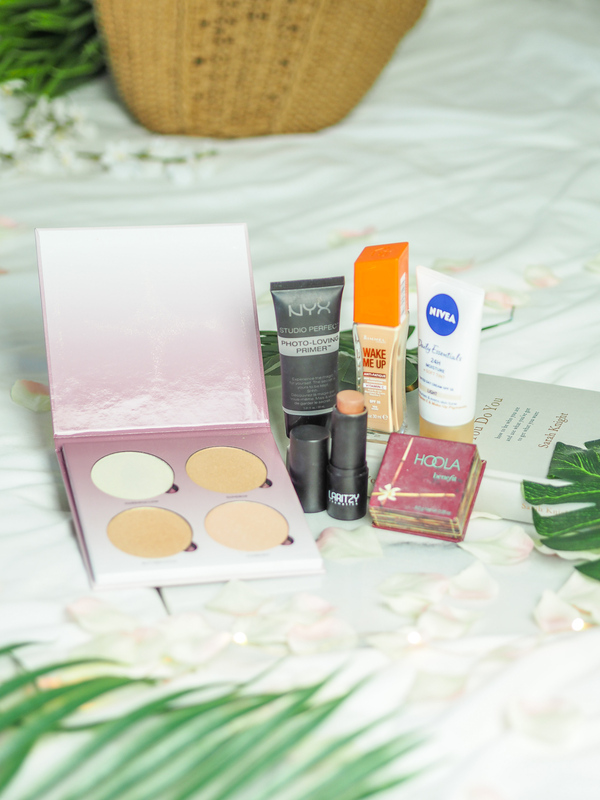 I’ve been using this for years – it was actually one of the first foundations I ever bought, and it always seems to come out to play when the suns out! In the bottle, it has visible shimmers in it but when applied these turn into a subtle glow. It gives the coverage I’m after despite being such a light texture. I usually apply one pump of this with a buffing brush and I’m good to go! When I’m after something a little lighter and don’t want so much product caked on my face, I’ve been using the Nivea Visage Tinted Moisturiser in Light. I got this off a whim in a random Superdrug order a while back because at £3 it seemed worth a try. My first time using it I wasn’t impressed but since then I’ve gone back and fallen in love with this product! Despite being a tinted moisturiser, it gives a decent amount of coverage and lasts really well on the skin, especially considering the price! I’ve been applying this with my fingers and then using a brush to buff it in – I’ve found a beauty blender just collects all the product on it. Despite thinking I’d hate this after my first use, I’m surprised to say I’ve been using this almost daily! 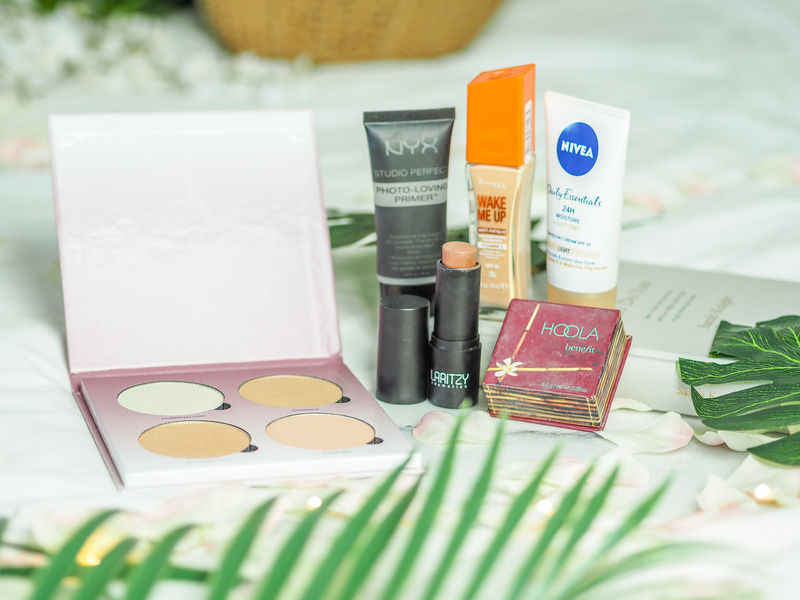 Onto the products which leave me looking like a bronzed goddess. The Hoola Bronzer is a staple in my routine all year round, and has been for about 3 years now! There’s not a lot to say about this product other than it does the job well – I use this on my cheekbones to contour and around my temples and forehead to help give a bronzed look. I think I’ll use this forever! The other new bronzing product in my routine is the Laritzy Shade Stick in Ahola. I got this in June’s Glossybox and have loved using it SO much! Before this, I’d never used a stick or cream bronzer, and I don’t know why because this beauty makes contouring SO easy. It’s the perfect shade for me and with a few swipes of it over my face and a quick blend, I’m looking 10 times better with a bit of colour! I really can’t praise this product enough – an absolute staple of mine! And finally, you gotta get that highlight poppin’ in the summer right?! To finish off the look I’ve been using the Anastasia Beverly Hills Sugar Glow Kit. My favourite shades have to be Gumdrop and Butterscotch. See my full review of this beauty of a palette here! What products are you using to get that glow? *This post contains gifted products and affiliate links. "4 redecorating mistakes you should be avoiding"
"What’s in the July Glossybox?"